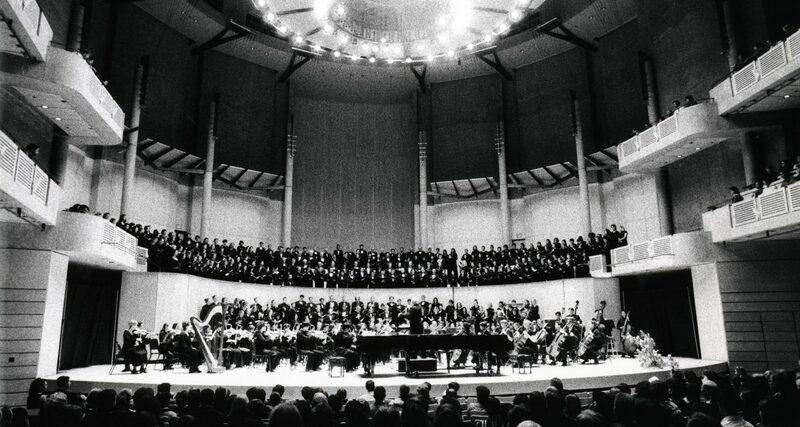 UBC School of Music faculty look back on the opening of the Chan Centre for the Performing Arts. “One of the more enjoyable aspects of my position as Director of the School of Music (1991 – 1996) was my involvement in the planning and construction of the spectacular Chan Centre, especially as it afforded me the opportunity to work with the late Bing Thom, architect of the project. Bing was one of the most elegant men I have met. On several occasions he would ask pertinent questions about music performance as it might be affected by the hall’s acoustics, and actually listen to my opinions. The most significant of my contributions to this dialogue was the suggestion that Artec Consultants be employed as the acousticians. “Performing in the opening concert of the Chan Centre was thrilling. It was so exciting to walk onto the brand new stage and to look up at those strings in the ceiling and the acoustic cloud hanging there above everything. During the rehearsal the hall technicians were busy adjusting and maneuvering the acoustic variables, and finally had things set. “I have some good memories of the Chan, the meetings with the late Bing Thom. I found out that he played the clarinet, but always wanted to be a conductor. I knew that we should play “O Canada” at the opening, and I invited him to conduct it — it would be the first official music performed at the Chan Centre. “I had the pleasure of conducting many choral concerts in the wonderful acoustics of the Chan Centre, ending my career with a sold out performance of Bach’s glorious B minor Mass. I appreciate that I was able to give acoustical input to the committee which resulted in the great acoustics we have today.